FBC Jax Watchdogs: The FBC Dallas Building Program: How're They Doing It? The FBC Dallas Building Program: How're They Doing It? In some upcoming articles I am going to take a look at the current capital fund raising and building program currently underway at First Baptist Church Dallas. We'll look at the proposed facilities, the cost projections, and most importantly we'll examine the sermons, meetings, and the use of powerful media presentations used to sell this project as God's will, to the members of FBC Dallas. We can't escape the irony of 2010 being the year that the Southern Baptist Convention is promising a "Great Commission Resurgence" and the GCR chairman Ronnie Floyd is telling us that to fund this GCR the money is in the "pockets and portfolios" of the church members - we see that one of the SBC's most historic churches is asking for its members to not dig into their "pockets and portfolios" to fund more missions, but to give 10% or more of all "personal assets" to build a $140 million dollar campus downtown - to the glory of God, of course. FBC Dallas' pastor, Robert Jeffress is a solid Bible expositor and a likeable guy. He seems to have done a very capable job of putting forth a vision to upgrade their aging facilities, then assembling a committee of church members who have studied various options for this vision and who employed the services of an architect to design several options. The committee made a presentation to the church November 2009 for what the committee thinks is the best option. It is a mammoth project completely transforming their campus, with a pricetag of about $140 million dollars - which is a bargain, the church is told, if they act now in a narrow window - but we'll delve into that issue later. Currently FBC Dallas is the middle of their capital fund raising program, which will lead them to a "Committment Sunday" on May 2nd where everyone will submit their pledge cards for their 3-year capital giving committment, an "Announcement Sunday" on May 16th, then a church-wide vote on June 6th on how to proceed based on what was committed. They had a pep-rally of sorts on Wednesday March 3rd with Jim Cymbala to call the church to prayer and committment to the vision. In the coming weeks we'll look at what has led them to this point, looking at the promises and results of their last capital program under Mac Brunson and a recent land acquisition that has the church STILL with $16 million dollars of debt, and the methods used to "sell" the $140 million dollar project to the congregation. Below is the "Manifesto" video from the FBC Dallas website if you want an overview of the project. For Generations to Come: Manifesto from Ascendio on Vimeo. Sounds like the new Court House we were supposed to have built several years back here in Jacksonville . . .downtown still waiting on completion because unfortunately the plan and how they told us it would be sucessfully financed in reality just didn't happen - due to the lack of incoming monies. Interesting article - taking on "debt" makes no sense to me with today's economy being what it is in today world but just the same do wish the good folks of FBCD good luck with this new financial endeavor. I'm sorry, I hope they fall flat on their financial face as they deserve to. More evidence that it is just about money, big buildings, big budgets. As if these were the mark of a real church doing real things for God. The main emphasis of any effort for the church, (any church) should be GETTING PEOPLE SAVED. For some reason some think if the building is newer, more modern and of course BIGGER this will help get people saved. Not so the proof is in the Bible. Most met in homes. Most were poor, and up to today money and buildings are not the criteria for SALVATION. These edifices are built to the glory of man. Pastors think if they are building larger edifices then they must be successful and Godly. Do any of these churches still have a WITNESSING PROGRAM? You know that is when people vist the lost to take the message of Jesus Christ. Most work done for the Lord is not done in churches, but by individuals one on one. People lie to themselves everyday about one thing or another. But, it is far too important for the churches to believe that money and buildings are the answer to the lost souls searching for the Lord. As a member of First Baptist, Dallas, the only way I can support this new building program is if we collect the money (not pledges) ahead of building and pay cash. We have buildings on campus that probably should be condemned and remodeling (again and again) is not a good option but going into debt to build is not the solution. When Robert was in Wichita Falls, they went into debt to build a huge worship center they didn't need, and he left. When Mac was here, the church went into huge debt to replace a building, and Mac left. It almost seems like they come to the church to build their buildings and then can't get out of town fast enough. Failure is doomed to be repeated when God is not in it! I have a lot of respect for my brothers and sisters in Christ who are part of this great church. But as a missionary serving overseas for the past 23 years, it is very difficult for me to understand how a church like this reasons and comes to the conclusions that this is God's will. Since when does God ask us to give for magnificent temples which he already stated are place where he does not abide (Acts 7:48-49)? In light of the implications of the Great Commission, how is it that we can justify such actions? It often appears to those of us serving on the mission field, that those back home are big on GC rhetoric, but little on the side of actually doing whatever it takes to see our world come to Jesus. I would not want a dime of that money for our own missionary work, but $140-million would certainly go a long way to making a major global impact on lostness if channeled in other ways. If I were a member of FBC-Dallas I would speak in favor of giving the first 50% of that $140-million to finance missions projects, trips, LMCO, and overseas partnerships to impact our world for Christ. Much like Elijah asking the widow at Zarephath to "first make a small cake of bread for me from what you have and bring it to me, and then make something for yourself and your son." Then stand back and be amazed at how God would bless and multiply that second 50% to do more in Dallas for the cause of Christ than if the entire $140-million was spent as planned. 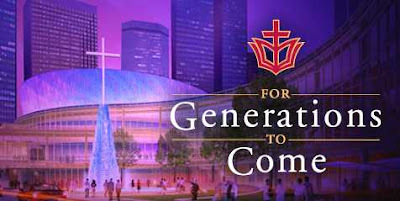 More of my thoughts about the $140-million campaign can be read <a href="http://guymuse.blogspot.com/2009/11/fbc-dallas-launches-130m-building.html>here</a>. Hey Guy - good question: how do they determine this is God's will? That is an interesting question, and one that I want to share on this blog in the coming weeks. Jeffress has preached how these kinds of big projects come about in general - that is how does God move churches to do these projects...he preached on it and I'll share that with you. But specifically, on this project, Jeffress has also shared how he came to know that God was behind this project, and he shared that with his congregation. Its very interesting, somewhat disturbing. Its interesting to me that they are proposing this 140 million dollar project when the church still has 9 million in debt from the Criswell building (Mac Brunson project), and a 7 million dollar land acquisition downtown...so while they still owe millions on the last project, they are ready to launch another one. Perhaps people aren't motivated to give to pay off old debt, but they will dig deep for a new project for the future. How about the Watchdog sticking with local matters in JAX and FL? Things may have slowed down there, and this is too easy a target--on the surface. You have every right to take on FBCJAX, but you are out of your depth now, leveling charges and questioning the motives of people you don't know and a ministry context you can't possibly completely know--necessary elements for making a "proper judgment." That is, if you feel called to a "broader ministry" of investigative reporting. How about we leave the Dallas matter between God and the local congregation. I can tell you firsthand, there is a remarkable amount of unity in the congregation on this project. The Dallas mayor, who is member, thinks this will have a major impact on the city and especially the revitalized downtown. So back off, please. There are lots of untold stories that give evidence of God's hand. One day they will be told, perhaps. Channel your voyeurism in another direction. And remember, "The Lord [will] judge between me and thee." Sounds quite threatening, and un-Christian, Anon. We will most certainly show-case what is going on in Dallas, and you're more than welcome to chime in. If what is going on at FBC Dallas is of God, then I'm certain you won't mind SBC bloggers knowing what is going on there, what is being said from the pulpit, and analyzing it in the larger context of what is going on in the SBC and the GCR. Nope, your previous pastor can't shut 'em down, and you won't either. Sorry. I'm a ministry staff member serving a church in Wichita Falls which is not the one Robert Jeffress served---and I admire quite a bit the leadership he and Walt (executive pastor) gave to the congregation here for its $21 million building project of only a few years ago. The new 1800-seat auditorium DEFINITELY was needed---the old one was close to 100 years old and very inadequate in lots of ways. Jeffress left for FBC-D before the project was paid for, but he assured the congregation that God already had provided the money to do so; he wasn't wrong---the entire project ($21 million) was built and paid for in about 4 years (some of FBC-WF's members are into oil---the recent prices per barrel were very good to them, and they passed along the blessing). A contemporary service was begun at the time the new auditorium was opened; that worship service now spills-over into the old auditorium on Sundays and a lot of people have been saved and baptized as a result in the last couple of years. I imagine that the same kind of leadership is being given in Dallas. Dr. Jeffress wasn't known in WF for his good people-skills, but he was known for good leadership. There's nowhere else in the Dallas area for a congregation the size that FBC-D is/can become to relocate to; remodeling is 75-110% of new construction (i.e., doesn't make economic sense to remodel---especially buildings as old as FBC-D; everything is a retrofit, and codes apply for which the congregation otherwise is grandfathered); building/re-building in its present location will be expensive---and doing it won't guarantee future growth (no such thing as "architectural evangelism"), but it'll help. FBC-D always has been a congregation with money and it hasn't minded sharing it for projects like this. If no one else has a much better plan for reaching Dallas for Christ, I favor the one they're using and encourage everybody that FBC-D will experience the kind of divine blessing that FBC-WF has. Nothing wrong with that, brothers (though I'm pretty sure somebody blogging here will find something wrong . . . ;- ] ). This question is for any church organization with outstanding debt. How is the church a good example and how can we teach our children Christian financial principles of staying out of debt if the church carries such huge debt as many do. And, how can we teach them to "wait on God to supply" NEEDS not WANTS when the church (any church) does not follow this principle? Especially when the debt is large and owed for so very long. anon said: "I can tell you firsthand, there is a remarkable amount of unity in the congregation on this project." I guess it depends on which circles you run in how much unity you perceive. I know of a large segment who are opposed and will not support it. I thought it was interesting how Robert came to believe this was God's will, heard him speak of it in a service. I believe that if this is God, He will provide the money; we will not have to go millions of dollars in debt. Do some investigating. Exactly how long has the mayor been a member? And what was happening in the city/church when he joined? And, dog, I think it's perfectly acceptable to bring to the forefront any church who is participating in out of control spending by the ceo pastor of the mega church corporation. Yes, it started locally for you but you are not even a member of that church any more. Why should you be silent about others? Why does God's will and plan always include hundreds of millions of dollars being donated by those folks He died to save and who are trusting in Him for their salvation? Is this why he died? Or did he teach and practice and model something else? Why must an awesome building always be the result of God's will? I like what Guy Muse had to say. And Guy apparently practices what he preaches. I would rather give my offering to Guy and his family, wouldn't you? "I can tell you firsthand, there is a remarkable amount of unity in the congregation on this project." Really? How much unity is there on feeding the hungry, clothing the naked, and doing things "for the least of these?" "I have talked with several of my pastor friends who serve (Serve???) at large SBC churches , and they are ALL experiencing difficulties in meeting budgets. The one strategic financial blessing that we enjoy at BBC that many of them don't is this - we don't have any debt! Because we don't have any mortgage to service, we are not forced , like many of them, to have to cut back on many significant ministries. This is a blessing..."
WHAT IS IT WITH ALL THESE PASTORS? It seems as though every pastor I have ever had has wanted to build a bigger building. Don't any of them ever try to plant churches elsewhere, i.e. take a group from their church, maybe help support them for a while until they can support themselves? It is such a waste of time and money to continuously have to be "building bigger churches for God". All they want is personal glory - to show the world and their peers how large the church is "they" have built. This "build bigger" mentality also fosters greed, because more people (giving units) equals more money (higher staff salaries, more bennies, perks...). No one that I know of would sign up to give for 30 years to a building program. Having a three-year commitment sounds do-able to the average member, who after three years of sacrificial giving, is then guilted into giving an additional three years because there are still millions to be paid off. Pastors can also leave after they persuade the church to get into a building program. They somehow always get "called by God" to a larger church. How many pastors have you heard of get "called by God" to a smaller church and lesser salary? How about someone from Dallas to tell Mac Brunson not to talk so much about FBCD and maybe we wouldn't care what you are doing - you people are one of his favorite topics to talk about here in Florida so why wouldn't our congregation be interested in your plans - apparently you are a role model for what Mac wants to happen here in our city. Sure wish you would have used your monies and kept him there with you - check us out on Wed & Sunday evenings as you will see he has no fan club. I live in the Dallas area and have been an admirer of FBC Dallas for some time. But that ceased shortly after Jeffress came back to town (he grew up a FBCD). This is nothing more than building to stroke his ego! Just a couple of years before coming to Dallas, he did the same thing in Wichita Falls, TX and left them sitting with the building and debt. Apparently that is the new M.O. for SBC pastor's (see Gaines at Gardendale, Brunson at Dallas, and Jeffress at Wichita Falls). AMAZING! Our little church is trying to raise $300,000 to relocate (we are renting facilities) and have a place of our own. Our pastor has said we need to trust GOd and not go into debt. And we are content to do so. And by the way, even though our current facilities are too small and inadequate God is still blessing. I believe paying cash for a huge project was the way Dr. Lindsay, Sr and Jr and Dr. Vines did it also. There were no betterstewards of Gods money than Dr. Lindsay Sr., and Jr. Both of these men were truly spiritual men of God. Neither would do anything to disappoint the Lord or take advantage of the members they pastored. One of the first things we're going to look at in Dallas is this: according to Jeffress, how would a church member know that it is God's will for their church to spend millions on a new church building? Jeffress has shared in his sermons how this works in general - how God communicates this to the church, and we'll examine that to see if it is scriptural and if it makes sense...and we'll compare it to how FBC Jax decided it was God's will to build under the Lindsay/Vines era. And Jeffress has described in great detail how THIS particular project was determined to be God's will, and we'll examine that. "Hey Guy - good question: how do they determine this is God's will?" Yes, excellent question. The kings of Europe insisted it was God's will to build the great Cathedrals which are now tourist attractions. The real believers were sneaking around to each other's homes and trying to escape persecution from the same 'godly' kings. The worldly will always be impressed with such material greatness and will support it. "How about we leave the Dallas matter between God and the local congregation"
Those who proclaim that these activities are God's will should be a matter of concern for all true believers. When God is misrepresented to the masses, true believers must speak up or we are enabling false doctrine to be taught. And we are helping to keep folks on the broad road which leads to hell. When the "local church" takes on worldly behavior and proclaims it is God's will, true believers must speak up. This is also true if the "local church" is Methodist and ordaining homosexual pastors. Would you respect local church autonomy by keeping silent on such a matter? Or would you proclaim truth to anyone who would listen that they are being led astray? This is always the reasoning that is given in mega's to determine the rightness of their direction. Numbers. But it ignores the obvious. Most mega church members follow their charismatic leader's 'vision'. That is the reason they are there. It also negates the fact that numbers do not always mean blessing or God's will. When Jesus said, drink my blood and eat my flesh, the masses who WERE following Him turned away. Does God want great buildings built for Him? Where do we see that proclaimed or even encouraged in the New Covenant? We see the opposite. The foundation we must build is SPIRITUAL UNITY. That sort of unity that Jesus prayed for us in John would lead AWAY from great buildings that only serve to puff us up. Who is the voice over guy on the Dallas videos? His voice sounds awfully familiar, probably a famous voice over guy. Very interesting that a church is using the voice of an actor/voice-over man from the world to sell the concept of their church make-over, to the church. Nothing good can come from Christians waging war on "mega" churches. Regardless of their faults. "Only by pride cometh contention." I believe some so called visions for the church, are only self grandiosement and ego building. God speaks now through His Word not verbally to any man even if that man is riding upon a horse in some foreign land!!! When Joseph was given the dream concerning 7 good years and 7 lean years he had spiritual awareness that most of us WILL never witness. Possibly the church is in the 7 years of leaness for a reason...get back to winning the lost, repenting of throwing some members under the bus, raising salaries and perks above the common man/woman they are supposed to SERVE, traveling first class especially on "mission trips" when others travel not, and preaching the whole counsel of God rather than taking license to speak of everything under the Sun by tickling ears and making jokes and robbing God"s time that should be used for preaching the Word. Not to mention through TITHES AND OFFERINGS that are given to do Gods work!!! PITIFUL, JUST PITIFUL GOING ONS. CWM. Cleansing and purifying maybe? Where is a war? What you seem to be bothered about is the discussion and opinions given here in a place you do not control. Once again, you come and rebuke but give us no content. I am quite pleased that many are questioning what they are seeing in Christendom these days. My prayer is that they immerse themselves in the Word. If they do, they will be warning folks with a passion to get out of these worldly temples. they will see that many with titles have puffed themselves up but have no biblical context for doing so. Where in the quest for large glamorous buildings that cost millions do you not see pride? Whom does it impress? God? Yep, there is a remarkable amount of unity around the 4-5 power families who will fund this project. It's also interesting how when Mac was at FBD saying the facilities were outdated and out of code, there were vocal (actually quite immature) dissenters who did everything in their power to disrupt and divide. Then Jeffress comes and says the building are out of date and old looking, and it's why yes indeed, they sure are - let's build! The simple truth is, FBD's campus IS out of date and out of code and needs updating for that reason. Facilities for kids and teens desperately need a transformation. But the church has not outgrown its worship center, with around 2000 total attending 3 morning services, one of which is not even in the sanctuary. When did Mayor Leppert join FBD? He was a long time member of another church in the city I thought. It seems it was pretty close to the kickoff of the project, as he appeared at the press conference. Hmmmm. The one strategic financial blessing that we enjoy at BBC that many of them don't is this - we don't have any debt!" Not sure what you mean by that first statement. But the only reason BBC is not YET in debt is because of the surplus monies set aside because of the wisdom of the former pastor, Adrian Rogers, which is now being drained rapidly. "How many pastors have you heard of get "called by God" to a smaller church and lesser salary?" Seeing the rendering of the "new"
reconcile going into debt when scripture warns against it? CMW - interesting that you equate a blog where people discuss their views about mega churches, mega pastors, mega projects, etc, with "waging war" and becoming "hostile". CWM: You are assuming that it is the Lords New Testament Church. vs.15:I know thy works, that thou art neither cold not hot; I would thou wert cold or hot. vs.16: So then because thou art lukewarm, and neither cold nor hot, I will spue the out of my mouth". Matthew 7:21: "Not every one that saith unto me, Lord, Lord, shall enter into the kingdom of heaven; but he that doeth the will of my Father which is in heaven. vs:22 Many will say to me in that day, Lord, Lord, have we not prophesied in thy name? and in thy name have cast out devils? and in thy name done many wonderful works? vs.23: And then will I profess unto them, I never knew you: depart from me, ye workers of iniquity". CWM: I don't think the bloggers here are hostile to the New Testament Church that Jesus ordained. But, what people are doing is RIGHTLY demanding ACCOUNTABILITY and questioning the the wisdom and motives of the leaders and preachers. They are not deity. They owe accountability to God and man. Absolute power corrupts absolutely! Something that all must guard against within the church. CWM. One thing you forget is that Christians learn from each other. That's how we grow. If no one ever told another of their faults the other person would never know it existed. We are to be lights in this world.That process concerns church people as well as the lost world. We are to express our thoughts on things whether acceptable or unacceptable. We are in other words to be our "brother's keeper" like it or not. This blog brings together varied personalities, thoughts, and opinions. I can find no fault with this blogsite. As a matter of fact I find it HOSTILE FREE. There is no war going on here just the freedom to exercise ones beliefs. You can agree or disagree that's what its all about. One thing is certain. This present day church age is the age where Jesus is standing on the outside knocking and cannot get into the church. Thank about that for awhile. Present day leaders have bought into this philosophy that they must build big and bigger buildings while others believe it a total waste of funds that could be better spent on feeding the hungry, witnessing, printing booklets, etc. Strange that a lot of these churches have so many buildings they presently don't even use since people are leaving or have already departed. CMW - interesting that you equate a blog where people discuss their views about mega churches, mega pastors, mega projects, etc, . . . There is a line between disagreement, and disparaging accusation. The "anonymous of March 12th 3:58" said, "I hope they fall flat on their financial faces as they deserve to." - I read that no other way but hostile toward the First Baptist Church of Dallas, Texas. The next comment said, "More evidence that it is just about money, big buildings, big budgets . . ." AND "these edifices are built to the glory of man." That is an accusation aimed at the heart and motives of the people of FBCD and Robert Jeffress. I VERY MUCH disagree with lavish waste, gold plated toliet seats, and country clubs with steeples on them. I do not however believe that they are all ill-motivated, faithless, koolaid drinkers. Obviously I am in the minority among your readers. I have never had a problem with dissent. I have always had a problem with Christians clawing at other Christians in their dissent. I feel really sad on Sundays, because I know the so called ministers of the Gospel (ha) are preaching prosperity messages again. Right!!!! Prosperity for THEM!!! You give they get....Prosperity!! "It is one thing to disagree with opulence, which I do. It is another thing to become hostile toward the Lord's New Testament church. " We are not discussing the Lord's NT churches. I am surprised that as a pastor you did not know that. To all those that are asleep at the wheel. The Bible tells us that at the end of the Age that the very elect will be deceived. Deceit comes by man and by words. We are to be discerners of the truth and watch for false teachers and those that preach discord among the brethren due to some bad decisions that they have made and they are now taking the heat. Thats what a real shepherd teaches his flock..watch out for anything among men that will harm you, or take you away from the true things of God. The church is going through some pretty deep waters currently and its up to the members to decide if they want to wade in. Some of us prefer getting out of the boat!!! Have you noticed in the last 25-40 years that there has been no great revival in our country. People had rather be entertained than learn the truths within the Holy Bible. Many churches spend billions of dollars on all kinds of entertainment which is no substitution for the deep truths taught in the Bible. I am afraid that many have left their first love , PREACHING THE WORD, and followed a false path of entertainment. CWM: We will all (Believers, of course) be perfect when we get to heaven. Many of us see more money spent and less souls being saved. Less, if any, help given to the poor, almost NO ministry to the down and out, hurting souls in this world. Money wasted on lavish lifestyles, trips, etc. We hear lots of "WORDS" spoken coming from pulpits, but very little POWER in them to save souls. Our judgements are not aimed at FBCD. We see "the church" FALLING AWAY as mentioned in 2nd Timothy. We know the time is short for us to reach lost people for Jesus, and as we see so much effort going into building big buildings that in the long run don't and won't matter, it is very frustrating for many. We will give an answer one day for all that we do and say. I hope we Christians won't be weighed in the balance and found wanting. Only what is done for Christ will last. Everything will be burned up including the big buildings. Jesus knows the motives for everything we do. No one hates FBCD or any other church. Many are alarmed at the direction churches have taken. Too many churches are not fulfilling the Great Commission as JESUS gave it, and have left their first love. Dissent sometimes is a challenge that makes us do better. And since you are a professional paid Christian, you get to decide which is which, right? I guess it has not occured to you that you are doing the same thing here using hyberbole with words such a war, hostile, etc. Funny how it isn't sin when the paid professionals do the same thing. These articles are not meant to be taking aim at FBC Dallas, or trying to unjustly ridicule or tear down their efforts. It just so happens FBCD is one of the more influential churches in the SBC, they have a $16 million dollar annual budget, one of the highest in the SBC, and they are undertaking one of the most ambitious local church capital fund raising programs in the history of the SBC, and it is very useful I think for lay people and pastors from all over to take a close look at HOW THEY ARE DOING IT. If God is behind it as they say, then no critical bloggers will thwart God's will. If its not God's will, then maybe something can be learned by seeing what they are doing. To Jeff from MS (CWM) and other WD critics who say to mind our own business, or to claim this is being "hostile" or declaring "war"...I would say to Jeffers credit, he has preached a very good sermon on how to deal with criticism and critics, back in February and you ought to take a listen. Jeffress doesn't say shut 'em down; he acknowledges that not all criticism is bad, and certainly not all of it is of the devil. He acknowledges that it is a fact of life that if you have goals and dreams and dare to do something big, there will be criticism, and leaders need to face it and deal with it, and know that it is inevitable. What is a measure of a pastor's leadership I think is not how much criticism they do or do not receive, it is HOW THEY DEAL with the criticism. I've said it before - Vines and Lindsay were criticized all the time in Jacksonville. They were ridiculed and hated by many people. But they never preached to shut people down like Brunson preached - and most importantly they didn't complain incessantly about how tough their jobs were and how much criticism they got! They just pastored, and led, and loved their people. Judging from his sermon on criticism in February, Jeffress is probably of the same mind - he will do what he feels God has called him to do, and he won't bother with the critics or try to shut them down. I 'm certain he won't complain about all the criticism he receives, and I'll bet that he won't have Paige Patterson tell SWBTS that he didn't get a "honeymoon" at FBCD, and he won't tell other pastors when preaching out of town that he's in a "hotbed of legalism". Jeffers is a much, much bigger man than that, I'm sure. So we will look closely at what is happening at FBC Dallas - not with the intent of tearing down, but to inform and analyze and yes, criticize at times. If any at FBCD don't like this blog discussing their capital program in depth, here is my advice: contact FBC Jax, as I'm sure they would be happy to share with you their secrets on how to deal with pesky bloggers and their wives. They have the process down pat. A good chapter to consider is Philippians, especially chapter 1 vs 12 "But I would ye should understand, brethren, that the things which happened unto me have fallen out rather unto the furterance of the gospel". What things? Beatings, stonings, shipwrecks and more beatings throughout Derby, Iconium, Lystra, and Antioch. Paul knew he had to go to Rome, yet he understood the trail would be covered in some of his own blood. He spoke and actually communicated with God personally which very few have ever done. His epistles teach us how a Christian is to behave, namely, to show the love of Christ even when those attacking you are out to kill you. None of us have suffered anywhere like what Paul or the other apostles did. We are still alive and breathing fresh air. We need to be soldiers of the cross and march forward winning the lost wherever we find them. Building greater buildings just to have a place to meet two or three hours a week without witnessing to the lost doesn't necessarily bring people into the Kingdom of God. It requires getting out one on one and that should be our number one goal. You never know when your words of encouragement may save a soul from Hell. Think about. Watchdog brings up a very interesting point "the will of God". Possibly there are some bloggers that post here are in God's will. "FBCD... they have a $16 million dollar annual budget, one of the highest in the SBC,"
now it's down to $20 million and still falling, thank's to Steve Gaines. The new auditorium is stated to seat 3,000 people. The existing auditorium seats 2,700 people according to Dr. Criswell's autobiography "Standing on the Promises". Why in the world would anyone spend this kind of money for 300 additional seats? This will not cut out the second morning service and bring a united congregation for worship. This smacks of being just a man building a pillar to his honor. Does anyone know how much money it would take to bring the buildings into code? That could be marketing spin to gain support. Depending on the "code violation", they may not be talking such large dollars. Do the code violations really warrant entirely new buildings? Since when is a church building "out of date"? To modernize a building for the sake of bringing it up to date is materialistic. Bigger and better. Bigger and better. Again, God's word is all sufficient. I have yet to know a mega church pastor who did not want some great building program or huge national event/activity related to his church to occur during his tenure. Anon 7:53....I am not sure what church you have been visiting but the children's area was redone under OS Hawkins and then again with Mac. Robert Jeffress then redid it when they hired Charlie McAllister. It looks like a ride at an amusement part up there now with 3D wall cut outs and corny visuals. I would beg you to find any school in the metroplex that compares. The teen area has been redone numerous times. RJ still had the nerve to tell the congregation that families will not attend our church because of the "smell". His nose should have grown 5 inches from that statement alone. I have no problem with updating and making things nicer. But at what expense? Most of us are living with appliances that could be nicer and newer. Same goes for our cars and homes. But to constantly preach from the pulpit that people will not come to know Jesus because we have "gross" , "outdated", "stinky" facilities makes me cringe. I am outraged that he has forced our young people to listen to this. Build if you want but be honest. RJ wants the newest and biggest church in the metroplex. Never mind that our church has turned its back on missions and actually helping people. We can be so proud that we have pews that are comfortable for taller people. Voice over is Ron Harris, former President of KCBI and a member of First Dallas. He has been on staff part time on and off for years. Don't know his current status. Criswell's book states the Sanct seats 2700, that is one of the many facts he lied about in his book. That current sanct seats less than 2000 with the choir loft included. I am a former member / usher and used to count the services.
" But to constantly preach from the pulpit that people will not come to know Jesus because we have "gross" , "outdated", "stinky" facilities makes me cringe." I could not help but think of the man on death row in a San Paulo prison who was forced to live with his own exrement for months because they do not have toilets who was given the Gospel by a passionate missionary (who braved the stink out of love) and saved before execution.
" I am outraged that he has forced our young people to listen to this"
You should be. It is a lie from the father of lies. But I am quite familiar with these lies. I used to tell them myself. Ummm...that is not Ron on the VO. He has done much voice work over the years for the church, is a member and leads scripture reading. But that is not him on the Manifesto. The VO guy sounds like Peter Thomas. You are right, my bad. RH had done something similiar early on in the process and I had one of my senior moments. I have no idea who that is. Question from FBCD member, while I do not have a problem with you blogging about our project there are alot of people that seem to believe this could be God's will. How can one judge that, especially from afar. To the other members, our buildings are terrible. The childrens area is ok because of the work that has been done but good grief the rest of it does smell and feel old and musty. FBCD member - yes, a lot of people at Dallas think its God's will. Maybe it is. But we'll start off by examining what your pastor says is the explanation as to how it is God's will. If it is God's will, and what he says is true, then he has quite a bit to teach the SBC about matters such as this. But perhaps you would concede that it might NOT be God's will. Just because there are people who are giving money to it, and because a pastor says it is God's will, and just because it is beautiful, and just because God COULD use such a building, you have to concede that perhaps its NOT God's will. So we'll start off by wondering what you've been told by your pastor about it being in the will of God, and we'll also talk about how churches before yours have determined multi-million dollar projects are God's will. But let me tell you something I learned at FBC Jax. I was there during several HUGE projects...the 10,000 seat auditorium in the early 90's, and the "state of art" Children't Building and Pastor's Suite built in the early 00's. And what reached people for Christ was absolutely, unequivically NOT these structures, as beautiful and as functional and comfortable as they were. It was the preaching of God's word IN the auditorium, and it was the hard work and dedication of hundreds of Christian workers committed to reaching grade schoolers with the gospel. The hard workers at FBC Jax, led by Shelly Baumgartner/Norman were as successful in the musty old 50+ year old children's building as they were in the NEW children's building. And Homer and Jerry preached and people got saved in the Ruth Lindsay and the Hobson as much or more so than they did in the new auditorium. God doesn't need a "Crystal Campus" to accomplish his will at FBC Dallas, that I do know. And to think that a simple man by the name of Patricius wisely considered paying a Druid king so that he could evangelize the people of Ireland! ...there are alot of people that seem to believe this could be God's will. How can one judge that, especially from afar. I can judge from afar by simply reading the bible and can easily conclude it is NOT, absolutely NOT, God's will for $140 million to be "robbed" and "siphoned off" from God's people, giving God's money, to build a building. Read the new testament. Giving to the least of these is giving to God. Never is building a building God's will in the New Testament. Are we still building temples to the glory of God who dwells in the holy of holies? Really? Then let's build it big! And the sheep will pay for it. And forget about the poor, the orphan and the widow. Sheesh! I wish Anon would at least consider that different opinions do not all come from " classic FBCD group". He might be surprised to learn that some people actually think for themselves and do not fit into any typical box. But that would only come from earnestly listening and having the mind to consider different perspectives. Anon 4:02. I agree. Wasn't it Jesus who said He would build His church!!! There was a lot of growth in the old Hobson from 1940 until now...the greatest growth in the history of the church percentage wise, even considering the Ruth Lindsay 3400 seats in 1976 and then in 1992 the current auditorium which has 10000 seats. Just look at what happens in most of these buildings on Sunday and Wednesday evenings when they remain half full. This probably occurs all over the country not just Jacksonville. Throwing money at a problem which can only be addressed by witnessing (increasing the congregation) will never be successful. Witnessing and being lovable to the unloved and the lost is the only answer. The NT church grew daily. It was a beacon of hope because of the love of the people of God. That is basic and until the church gets back to basics it will only be a building just like any other social meeting place. Remember when you put millions of dollars into a new building you have to have ready cash available for proper maintenance which can be quite expensive. You don't have to keep coming back year after year begging for money when you occupy sufficient space to accommodate those that attend. Just having a large building thats half full is waste pure and simple. The use of funds over and above whats necessary should be given to the poor, sick, or widows as the Bible teaches...this is God's will. FBCD worships currently in a sanctuary that is 120 years old. That is almost 50 years older than Hobson was when the new room was completed. FBCD is one of the largest contributors to the IMB in the state of Texas. A building today uses a fraction of the maintenance and utilities of one built in 1920s (current occupied space) Better stewardship. FBCD help build and nurture the largest homeless shelter in the city of Dallas. This ministry now successfully operates on its own. Now you at least know some facts. I'm not sure that the dissenters will ever be heard. So far, the building has been conceived by a committee of the wealthy (mostly men); proclaimed by the "pastor" to be God's will because the wealthy started giving him money for the program before there was a program; a big gathering Sunday was proclaimed and the "new building" was presented to us in a huge multimedia presentation as a done deal. No discussion, no vote. A few Sundays later, the Sunday school group met by age levels to ask "questions". We missed that event so I can't speak to what happened there. But still no vote; the people have no voice here. All this is the action of the CEO pastor of the mega church corporation and his committee of the wealthy. So no, I don't support any of this. FBCD has virtually stopped supporting our local mission ministries and yet we call ourselves a missions-minded church. There was hardly any mention of Lottie Moon this year and the amount we're giving through the cooperative program to missions is unknown. And no, we not leaving FBCD, not unless God specifically leads us somewhere else. We have 25 years here; this is where our "church family" is. We've been through a lot and hopefully this too (Robert's regime) shall pass. Fellow member here. Thank you for saying what so many of us are feeling. Unfortunately, Robert Jeffress and his sidekick Mark Lovorn has silenced any discussion to even question the plan. And you are right, the plan was in motion before the church even had any idea. It's very hard to leave a church you love and that your life has revolved around for over 30 years. Yet at some point you have to stand for truth and not compromise by tacitly sitting there Sunday after Sunday. FBCD is no longer our church home. We still have many, many friends there. We grieved deeply over leaving, but more deeply over what the church has become. Our life is so much more peaceful since we have left. We have more family time, especially Sunday afternoons and evenings. In other churches we have visited, we actually worshiped - something we have been starved for for over 2 years. Just clocking in and waiting for a regime change was not an answer for us. Not this time. We just started visiting this church the first Sunday of the capital campaign (perfect timing), and I am conflicted about the whole project. As a 5 year Dallas resident, 25 year Houston resident I have noticed that Dallas is one of the most superficial cities around. The price tag is too much. Whenever I see video testimony of people my age giving everything in their savings account, or their downpayment for a home to the building effort I get scared. I believe that we should first pay off the previous pastors' visions debt, and then prayerfully consider an expansion. I just have the feeling that I am paying for some pastor's legacy, and not much more. It also does not feel like there was a vote for this whole thing, it just kind of was presented. We will be visiting some non baptist churches in the coming months. I am a member of First Dallas, (although that status will change soon). I was baptized by Dr. Criswell and I am very familiar with all of these people in this project. There was never a "vote" within the congregation on this project, only a series of meetings held with the agenda of convincing the congregation that this is the right decision. A series of "Q and A" if you will, with politically correct answers to each and every question. My husband and I took a Dave Ramsey course at the church and are following his godly plan to become debt free, a difficult process in light of the fact that my husband is in the mortgage business and we have lost much in this economy crisis. We are learning to budget all money and live strictly off of cash and have a plan in place to eliminate our debt and build back up our safety net of 6-9 months salary in case of an emergency. Dr. Jeffress told the congregation just this morning not to do that, not to listen to the advisors, but to trust in God as our safety net. Appauling, truly appauling. I mostly worry about the elderly membership who will do as instructed and give beyond what God has called them to give, simply because "The Project" committee invested millions in a campaign that is designed to swindle folks. I think someone should examine to financial lives of those on the committee that chose to move forward with such a project. I think pictures of their homes and gated community should be posted so that people can see who is giving "sacrificially" and who is not. I hope that there is more negative media coverage so that those who have been deceived will awaken to the truth and the true nature of God. God does not want this church in further debt. The mayor joined the church only two months ago. It was a political move on his part to encourage the rebuilding of the city. We are gravely disappointed in the lack of integrity in this project, and are broken-hearted to see our church step outside the will of God in this way. Todays lesson "Sermon on the Amount" Sorry I didn't hear it as I got up and walked out. The past few weeks we have heard testimony from members of how they believe God has led them to pledge so much more than just 10 percent of their income. Robert Jeffress lives in a house that is listed on the tax rolls at 770,000. Perhaps he will sell it and move in to less expensive house so he can help fund his mega-church! Another FBCD member, I could not agree with you more. Jeffress is pulling out all the stops to get his legacy building. I remember during the Criswell Center campaign the church gave promotions of giving up Starbucks for 3 days a week and give that amount to the building, or not going to a movie every week and contribute that money to the building. But this psychological manipulation that is going on to get people to give up 10% of assets, downpayments for house, entire life savings, is just way over the top. I can clearly seen the guilt trip he is trying to place on people if they don't make a once in a lifetime sacrifice. Pretty disgusting! I'm just a little angry right now over reading the comment about Dr. Criswell's autobiography, in which the author stated that "it had many lies." When someone starts attacking Dr. Criswell, I get "all shook up." Criswell had his critics for sure, and he was not perfect. However, give me Criswell over Jeffress any time. Of course, Dr. Criswell is in Heaven now and cannot come to his own defense. He was my pastor for many years and I loved him and his preaching dearly. I might add, when Dr. Criswell got up to preach, he didn't dictate which Bible to use. He opened the Book, KJV, and I followed along. If a pastor is lead by the Holy Spirit, he will be able to understand God's Word. Also, Criswell told Dr. Gregory: "No Rock Music." I just can't stand to hear someone say things about Criswell when Criswell is not here to reply. Well, I'm just too upset over this casino-type building with a cross on the top to go on. Oh, Wonder when Jeffress is going to bring in the slot machines, as he already has brought into the church enough entertainment. Whatever happened to "Come out from among them..."
Now that it is September of 2014, does anyone know how much debt FBC of Dallas is carrying? Has anyone heard how much debt FBC of Dallas is now carrying?